Specializing in your custom text engraved on the stone of your choice. Design Stone Engraving offers a variety of garden art in stock. We also welcome your unique garden art design. Address stones, blocks and boulders can be designed to meet your needs. Pet memorial and pet marker designs to meet your needs. Brick paver and bronze fundraisers, wedding stones, onsite engraving, final date engraving and memorial cleaning and restoration is one of Design Stone Engraving's specialties. We also carry a complete line of Memorials, Monuments, Flat Markers, Bronze, Benches and Granite Accessories. 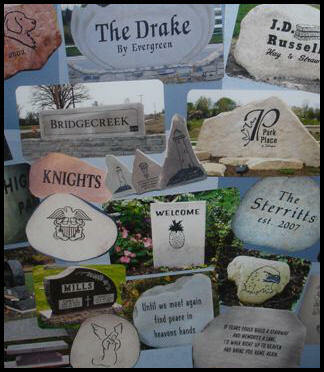 Design Stone Engraving welcomes your customized personalized artwork.